Thousands of residents are evacuating areas in Northern California as an uncontained wildfire races towards several towns in the Sierra foothills. The Camp Fire, which started early on Thursday near Camp Creek, has been fuelled by strong winds and dry forest. Neighbourhoods, schools and hospitals have been evacuated while some residents in the town of Paradise were trapped by the flames, officials say. Authorities said there are unconfirmed reports of casualties. 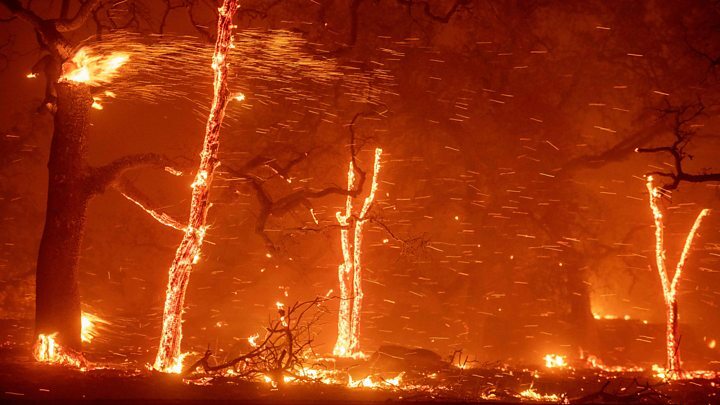 The Camp Fire has burned through 20,000 acres as of Thursday afternoon, local time, according to California Fire officials. Further south in Ventura County near Los Angeles, strong winds are preventing efforts to tackle another massive blaze – a few miles from the scene of a mass shooting in Thousands Oaks that claimed 12 lives on Wednesday. Emergency crews are working to rescue residents trapped there, he said. The blaze is one of 14 currently active in California. Officials have put most of Northern California is under a Red Flag Warning, which means “extreme fire behaviour” can occur within 24 hours. Resident Shari Bernacett told the Associated Press that she “knocked on doors, yelled and screamed” to get mobile home residents to leave as fire consumed the hillside.